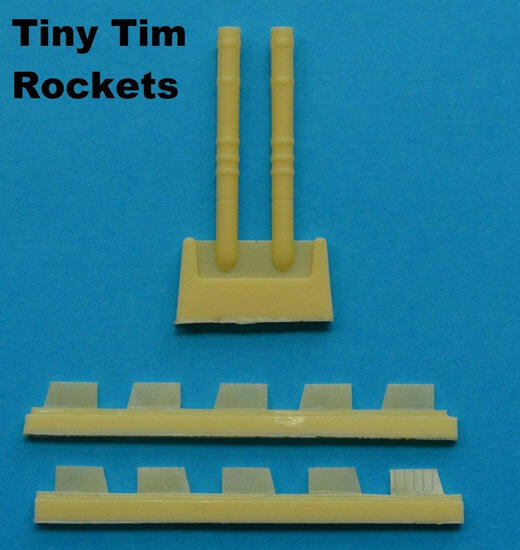 12 yellow resin pieces, enough to make two rockets + instructions and painting guide. 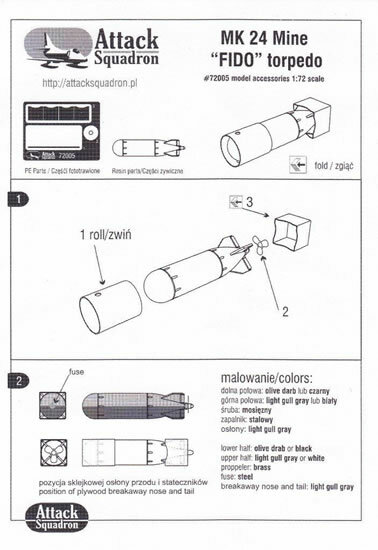 1 resin torpedo with single PE sheet + instructions and painting guide. Nice fine detail in resin. Highly recommended. In early 1944, the U.S. Navy was in need of a powerful anti-ship weapon with some stand-off range to keep the attacking aircraft outside the range of heavy air defences. The new fast fighter-bombers of that time couldn't drop torpedoes, and the existing rockets were not large enough to be useful against heavy shipping. In March, CalTech showed that a large calibre air-launched rocket was feasible, and the Navy subsequently ordered to develop such a weapon with the highest priority. The result was a rocket of 11.75 inches diameter, which eventually gained the nickname Tiny Tim (obviously an ironic pun on its size). The apparently odd dimension was chosen; because it matched the diameter of the standard 500 lb SAP (Semi-Armour Piercing) bomb, which was used as the warhead, as well as the diameter of standard oil well steel tubing, which was used as the casing. By December 1944, the Tiny Tim was ready for deployment and pilots had been trained. The rocket could be fired from F4U Corsair, F6F Hellcat, TBF/TBM Avenger and SB2C Helldiver aircraft. However, the weapon came effectively too late for use in World War 2, and was reportedly only used at Okinawa in small numbers (with unknown results). Tiny Tim was later used with some success during the Korean War. 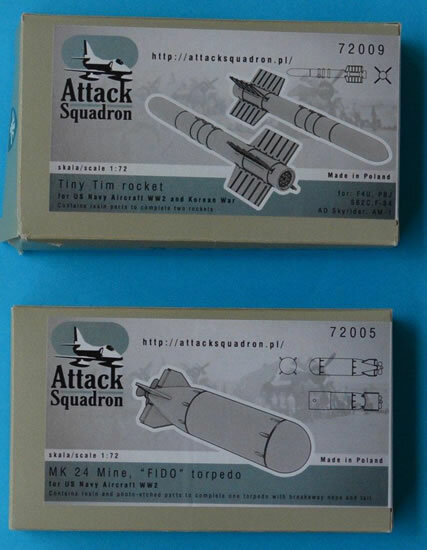 This set comes in a zip locked bag within the end opening box from the Polish modelling company “Attack Squadron”. You get two rocket motor bodies (with very nice detail at the exhaust end) and 5 fins per rocket (one spare), to assist with assembly there are slots moulded into the rocket bodies to assist with the fin placement. Again this is another very simple resin improvement for your Late WWII or Korean War, Vought F4U Corsair, NA PBJ Mitchell, Curtiss SB2C Helldiver II, Republic F-84, Douglas AD Skyraider, or Martin AM-1 Mauler. The Mark 24 Mine (also known as FIDO or Fido) was a US air-dropped passive acoustic homing anti-submarine torpedo used during the Second World War against German and Japanese submarines. It entered service in March 1943 and continued in service with the US Navy until 1948. Approximately 4,000 torpedoes were produced, sinking 37 and damaging a further 18 submarines out of a total of 204 fired. The torpedo was also supplied to the British and Canadian forces. 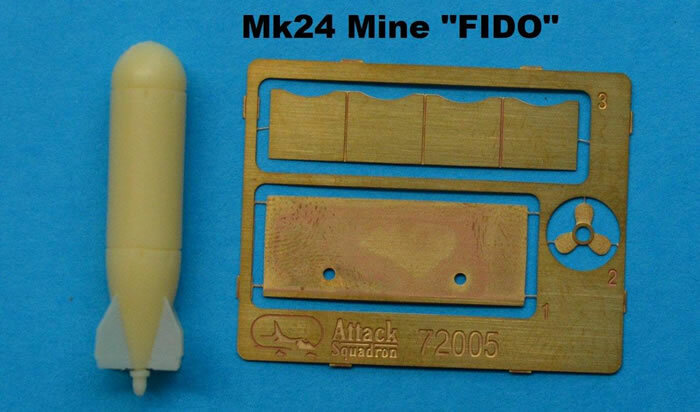 The deceptive name of "Mark 24 Mine" was deliberately chosen for security purposes i.e. to conceal the true nature of the weapon. The Torpedo comes as a single resin piece with a PE propeller. One unusual feature with the Mk 24 was that it used a breakaway nose and tail of light plywood. The ring nose prevented the torpedo from diving too deep on hitting the water, and the tail protected the steering surfaces and the prop on impact. These are provided as Photo etched parts in this kit. Nice simple solutions, lovely moulded detail, highly recommended. 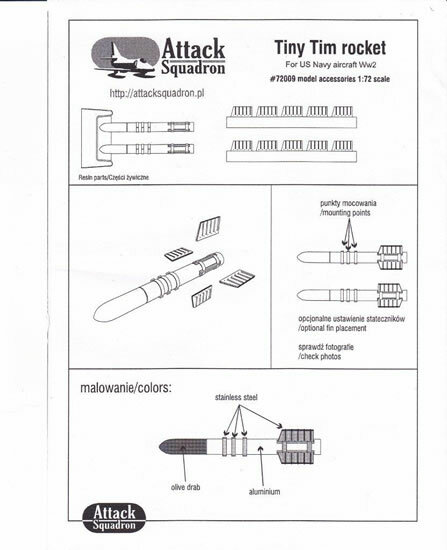 Thans to ADALBERTUS and Attack Squadron for the review sample.